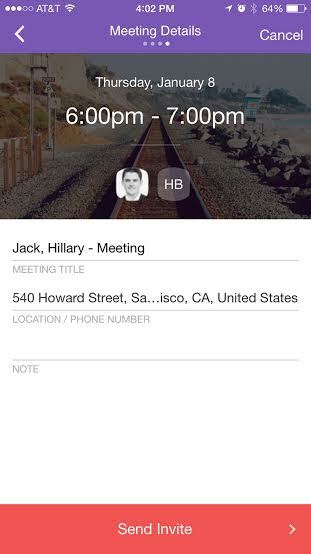 Pick is a desktop and iOS app that aims to help you find time a good meeting time for a group of people. Instead of blasting an email out to everyone with a bunch of random times in hopes one of those works out, it collects info from all your calendars and determines when everyone has time to get together. The app quietly launched on the App Store a couple of days ago without much fan fare. It’s currently in the 856th spot for productivity on App Annie. However it was soon spotted and posted on Product Hunt. It hit the number one spot there yesterday. Virtual schedulers have boomed in the last year. X.ai’s life-like virtual assistant “Amy” launched last May and now sits at a $40 million valuation. Both x.ai and Clara help you schedule a time to meet with others by cc’ing the machine assistant in your email. You tell Calendly which meeting times you prefer ahead of scheduling something. Zirtual offers an actual assistant to help you with scheduling and more, but it’ll cost you a couple hundred bucks for a few hours of their time each month. Most machine assistants are offered free. Pick Co-founder Ryan Mindigo hinted that there would be an enterprise version that would cost a bit at some point. Mindigo says the app part of the service is what sets his scheduling assistant apart from all the rest. “You have to remember to cc the assistant in your email with the others. Who wants to do that?” he asked. Mindigo and his co-founder Michael Selepec came up with the idea while working in the sales department at Yammer.”Because Yammer was such a large acquisition, our inboxes were flooded with messages from recruiters requesting to meet,” Mindigo wrote in a recent blog post announcing the launch. The two started out together in Yammer’s early days, before Microsoft. Their original idea was to use the tool for scheduling sales calls. “While anyone who uses a digital calendar can use Pick, we feel that many of our early adopters will be sales professionals,” Selpec wrote on Product Hunt. Mindigo and Selpec already knew there were a lot of options out there, including just hiring an actual assistant. But assistants cost money. They didn’t think the free or cheap solutions were good enough, either. “Instead of trading text messages for a week, you can now send a calendar invite from you phone that is based on mutual availability in 15 seconds,” says Mindigo. Though enterprise sales is the target-market, Pick plans to go after a much wider audience and incorporate the 1 billion+ users on Outlook, Google Calendar and iCloud. Pick is a boot-strapped operation thus far. However, Mindigo mentioned it would probably be looking to raise a round at some point in the near future. He teased out that Pick could help you manage your relationships in the future, too.